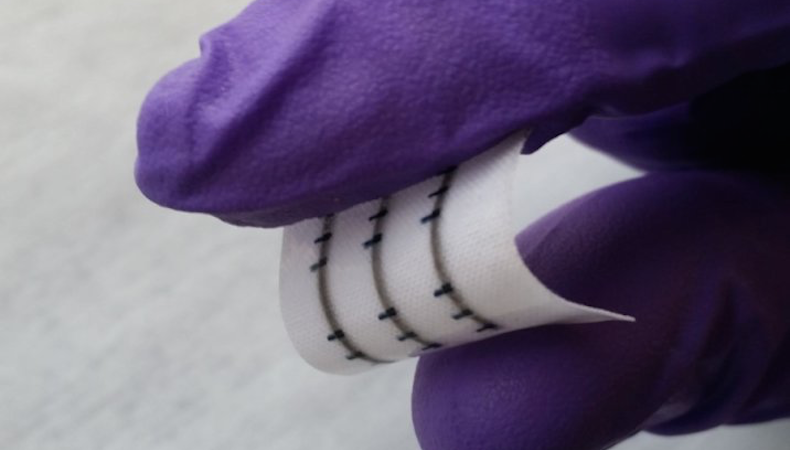 Researchers have successfully incorporated washable, stretchable and breathable electronic circuits into fabric, opening up new possibilities for smart textiles and wearable electronics. The researchers, from the University of Cambridge, working with colleagues in Italy and China, have demonstrated how graphene -- a two-dimensional form of carbon -- can be directly printed onto fabric to produce integrated electronic circuits which are comfortable to wear and can survive up to 20 cycles in a typical washing machine. Based on earlier work on the formulation of graphene inks for printed electronics, the team designed low-boiling point inks, which were directly printed onto polyester fabric. Additionally, they found that modifying the roughness of the fabric improved the performance of the printed devices. The versatility of this process allowed the researchers to design not only single transistors but all-printed integrated electronic circuits combining active and passive components. "Digital textile printing has been around for decades to print simple colorants on textiles, but our result demonstrates for the first time that such technology can also be used to print the entire electronic integrated circuits on textiles," said co-author Professor Roman Sordan of Politecnico di Milano. "Although we demonstrated very simple integrated circuits, our process is scalable and there are no fundamental obstacles to the technological development of wearable electronic devices both in terms of their complexity and performance." Story Source: Materials provided by University of Cambridge. The original story is licensed under a Creative Commons License.